Offshore Oil Rig Jobs - Why work in the oil industry? Currently, this is one of the world's largest and most important industries, and it will continue to be for the foreseeable future. Oil provides over 80% of the world’s transport fuel needs and accounts for about 50% of the world’s energy needs. The modern world runs on oil. Right now, there are over 5000 companies around the world drilling for oil and gas. Most of their installations are located in oil rich parts of the world: the United States, Canada, Saudi Arabia, Kuwait, the United Arab Emirates, Venezuela, and Nigeria. 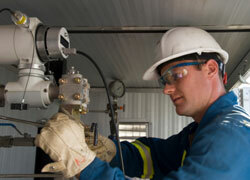 Technology drives the oil industry. That’s why it relies on skilled workers to safely fill the wide variety of jobs available – from operating machinery on the rigs to operating computer systems. And, of course, there are many jobs that require strength, guts, and determination. There are many advantages to working in the oil industry: it provides a huge amount of job variety; enables its workers to earn an excellent income; and, of course, there are many opportunities for career advancement.